The inspection was undertaken by a Directorate of Revenue Intelligence team at the Indira Gandhi International airport. NEW DELHI: The Directorate of Revenue Intelligence today claimed to have busted an international hawala racket after arresting two people, including a woman Jet Airways employee who was allegedly trying to smuggle out foreign currency worth over Rs 3 crore. The DRI officials intercepted the Jet Airways flight attendant when she had boarded a plane that was scheduled to take off for Hong Kong yesterday, the agency said in a statement. "During examination of her checked in and hand baggage, USD 4,80,200 wrapped in aluminium foil having a market value of Rs 3.25 crore, has been recovered," it said. During interrogation, it came to light that the woman was part of a major international hawala syndicate and has carried foreign currencies several times for a Delhi-based hawala operator, who was also arrested from here, it said. The employee was identified as Deveshi Kulshrestha and the alleged hawala operator as Amit Malhotra, a resident of Vivek Vihar area in Delhi, a senior DRI official said. He said Malhotra used crew members for smuggling foreign currency. The official claimed that Malhotra would collect money from some bullion dealers in Delhi and send it to select foreign destinations using a flight attendant. The money was being used for purchasing gold abroad and later sent to India illegally, the official said. Both Kulshrestha and Malhotra were produced before a designated court which remanded them to two days of judicial custody. They will be produced before a Metropolitan Magistrate on January 11. Malhotra had befriended Jet Airways crew six months ago during a flight to India, he said. The DRI has recovered Rs 3.3 lakh in cash, and foreign currencies of different countries worth USD 2,500, besides several incriminating materials from Malhtora, the official said. 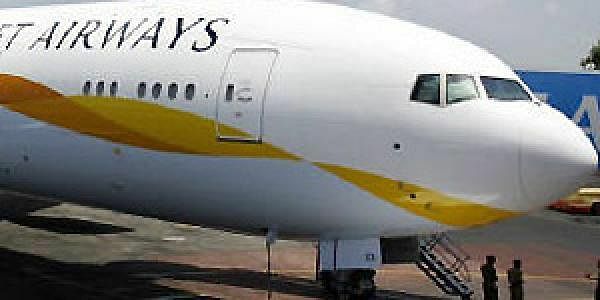 In a related development, Bombay Stock Exchange and National Stock Exchange have sought clarification from Jet Airways on the matter and the response from the airline is awaited.